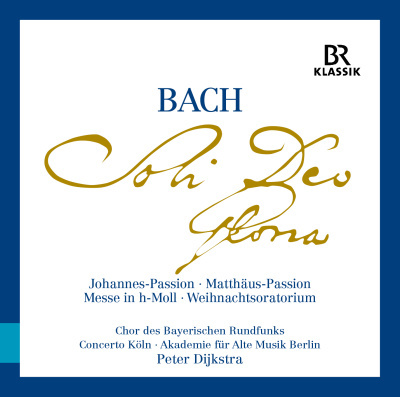 Complete Edition with the Bavarian Radio Chorus under Peter Dijkstra, together with Concerto Köln and Akademie für Alte Musik Berlin: audio recording of the four great oratorios by Bach, on a total of nine CDs. Soloists: Christina Landshamer, Karina Gauvin, Rachel Harnisch, Anke Vondung, Gerhild Romberger, Maximilian Schmitt, Julian Prédardien, Tilman Lichdi, Tareq Nazmi, Karl-Magnus Frederiksson, Michael Nagy, Krešimir Stražanac, Christian Immler. At the beginning of the 500th anniversary of the reformation by Martin Luther in 2016, BR-KLASSIK released the Complete Edition with the Bavarian Radio Chorus under Peter Dijkstra as 9 CD-boxset.